Use groups to visually mark one or more items or make it easy to keep a set of items together. An icon, image, or text box can be part of only one group. You can nest groups, one inside another. The size of a group cannot be managed manually. Is adjusts automatically to fit around its contents. Groups have a semi-transparent background, a solid border, and an editable title. Groups cannot exist without having some contents. Deleting the last item in a Group will cause the Group to also be deleted. Groups are useful when you want to visually mark one or more items with a semi-transparent background and a title or make it easy to keep a set of items together. 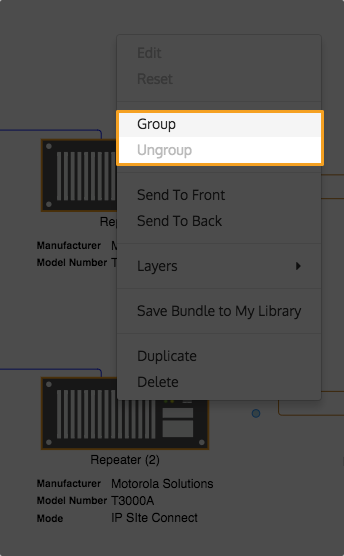 Create a Group by selecting the items to be part of the Group, then right-click on one of the selected items, and select Group from the options in the context menu. Remove something from a Group be selecting one or more items that are currently in Groups, then right-click on one of the selected items and select Ungroup from the options in the context menu. Move a Group and its contents by clicking and dragging the Group.